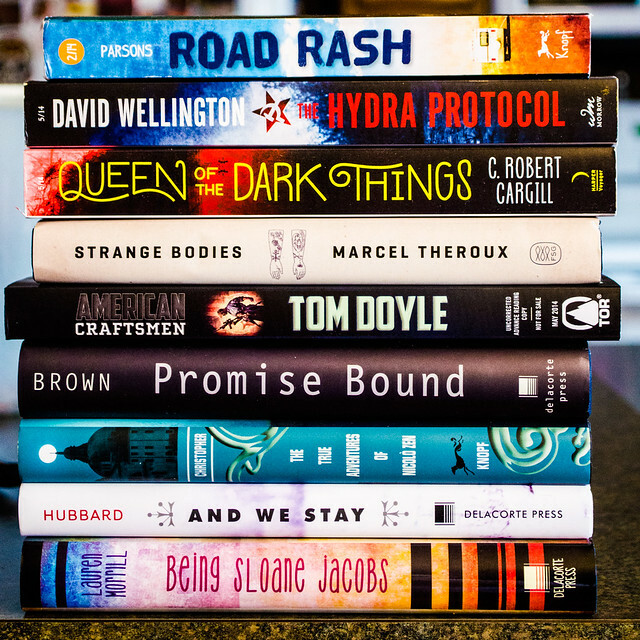 I noticed it was a slow couple of weeks for getting new books and ARCs in, and then I remembered it was the first couple of weeks of January, and it takes a little bit of time for the PR machine to get up and running after the holidays. And sure enough, today all of this showed up at the door. And thus, duly reported to you. So: Anything in either stack that catches your eye? Let me know in the comments. Love! Time travel! Pizza! All things most of us, at least theoretically, enjoy. But how to tie them all together — with some deeper meaning to boot? 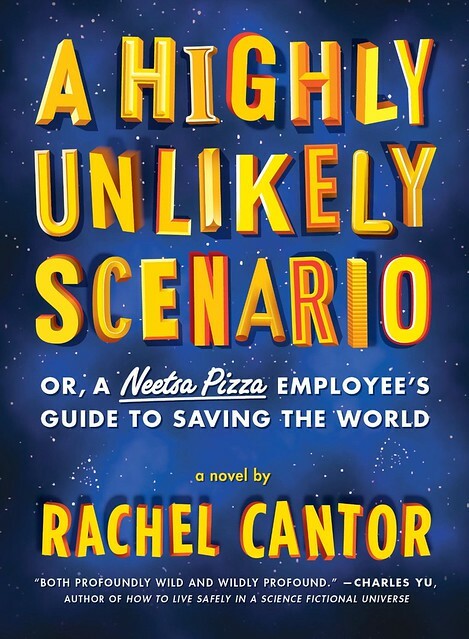 Rachel Cantor’s makes the attempt in her new novel A Highly Unlikely Scenario, or a Neetsa Pizza Employee’s Guide to Saving the World. Here and now, she explains how she made those first critical connections. Leonard is a complaints guy for a national Pythagorean pizza chain. In his world, Whigs, Heraclitans, and other ideologues seek converts through proprietary fast-food chains; Catharites and armed followers of the thirteenth-century scientist and friar Roger Bacon engage in bitter battle to claim the untranslatable Voynich manuscript; and all are vaguely under threat by a neo-Maoist movement that’s trying to radicalize the middle classes. Into this world arrives Isaac the Blind, a thirteenth-century rabbi who can read people’s souls; he needs Leonard’s help. Leonard’s journey takes him from his White Room, where he relieves Clients-in-Pain with Neetsa Pizza coupons, to the fortress of the Latter-Day Baconians, to thirteenth-century Rome. Along the way, he must save the world with the help of Marco Polo, a rare-book librarian, his cartoon-drawing nephew Felix, and a quivering aleph. A novel about a million things, seemingly. Yet it arose from one big idea. A big idea that itself arose from an unlikely source. I attended a silent meditation retreat some fifteen years ago. For about ten days, we sat, we walked, we sat, we walked; we did not speak. The leaders, however, spoke: usually about meditation, but one evening they speculated—for reasons I can no longer remember—about the great flowering of mystical experience in the thirteenth century. The Kabbalah was born around that time, with the help of Isaac the Blind; the Zohar was written around 1280, which is also when the great Abraham Abulafia, said to have magical powers, was developing his eccentric meditative practices, variants of which we were attempting on this retreat. Rumi and other great Sufis were writing mystical poetry, while mystics such as St. Theresa and Meister Eckhart were changing Christianity forever. What most struck my teachers, who were mostly rabbis, was how this mystical profusion could occur at a time when practitioners from various traditions could not, presumably, communicate with each other. Or could they? Was there something—some force, some energetic—that connected these mystics around Europe and beyond, supporting their practice and increasing its creativity? I like to think I always listened to my teachers, but I may have been especially attentive on the night of this talk. I had just published a story about the medieval trader Isaac the Jew (no relation to Isaac the Blind), who’d transported an elephant from the emperor Harun ar-Rashid in Baghdad to Charlemagne’s court in Aachen. I was then in the process of writing a novel about Dante’s Vita Nuova, a thirteenth-century work that ends with what can only be called a mystical vision. When my teachers talked about the Middle Ages, I listened especially hard! Unlike many ideas, this one stuck. 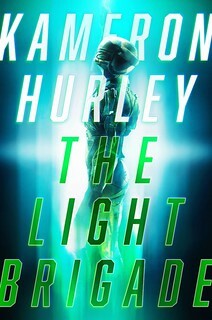 When I finished my Dante novel (Door Number Two, forthcoming from Melville House in 2015), a “realistic” work that concerns themes close to my bones (love, the purpose of art, family relationships), I was ready for something different. Something completely different. I wanted a change, I wanted to write something fun! I remembered this big idea. I remembered the hotline, the put-upon mediator, Marco Polo in his Genoan jail cell. Big ideas accrete other ideas—in this case, Pythagorean number theory, a fascination with ghostwriters (Marco Polo had one, Moses de Leon and other mystics claimed their books had been written by others centuries before), the bizarre features of the unreadable Voynich Manuscript (which I learned about in my alumni magazine! ), a concern about how ideology can be used by politicians to distract people from serious political or economic concerns, a love for the topography of ancient Rome. All these came into play with A Highly Unlikely Scenario, or a Neetsa Pizza Employee’s Guide to Saving the World, as this new book came to be called. I soon realized, however, as writers are wont to do, that it wasn’t enough to sit Leonard in a room fielding phone calls from mystics! Things had to happen. There had to be incident, conflicts, adventure. I did some research. In 1280, Abulafia was in Rome, intending to convert the pope by sharing all sorts of signs and wonders with him—it was only the Pope’s death a few days before his visit that saved Abulafia’s life. Wait, a Jewish mystic thought he could convert the pope? By sharing mystical secrets? I grew up in Rome! I wanted to write about Rome, I loved writing about Rome! How to get Leonard away from his pizza-complaints hotline? 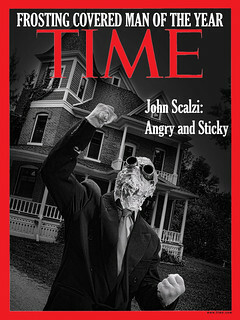 How to make of him not just a put-upon mediator, but a hero, however unlikely? In this way, the big idea evolved: by the time the book was finished, the mystics I wrote about were not necessarily communicating with each other. They were aware of each other, sure, they could and did travel across time and space to meet with each other, but this was no longer the point. The point was that they had access to mystical knowledge and a desire to share it, even though sharing it would endanger the world! By Part Two, Leonard had left his phone behind for good: he was out in the world. By the end of Part Three he had saved the world not once but three times, and this involved time travel, it involved peril and chases and the development of courage; it involved living by his wits; it involved falling in love. The big idea had become story! Visit the book page, which features an audio excerpt. Visit the author’s site. Follow her on Twitter.